You can’t publish that I was told in no uncertain terms. Mention was made of ‘Fifty Shades of Grey’; what on earth did they mean? “Juvenile humour” I was told. How appropriate from one who has entered his second childhood from his first without any intervening period! Publish and be damned! My original piece was un-illustrated. I have learnt in my year of blogging that pictures help to make one’s real meaning explicit (oh dear, there I go again). There will be no pictures of me bathing! Lying in the bath my thoughts inevitably wander… to soil water holding capacity. My hand idly goes to... a small rectangular bath sponge. I gently lift it out of the water and hold it horizontally. Water immediately pours out. If I continue to hold it steady, no more water drains. Is water in the soil like that? Yes! Growers would say my sponge -representing the soil - was at field capacity. The water that spills from the sponge as I picked it up equates to drainage. No more water falls from the sponge as I continue to hold it steady, even though it is still very wet. Is a soil like that? Yes, no water drains from a soil that is only at field capacity. I take my empty coffee cup and gently pour a little water over the still horizontal sponge (Damn, I need an extra hand). 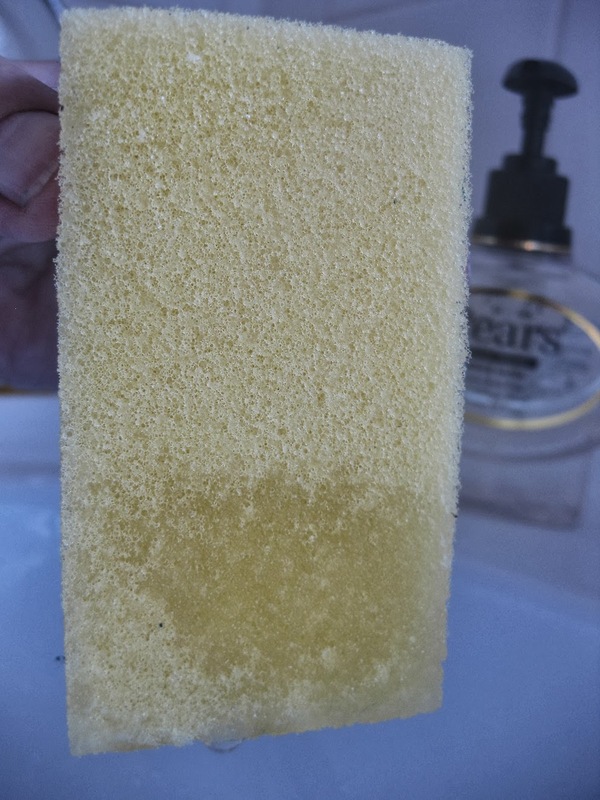 An equivalent amount of water drains from the sponge. Soil water behaves like that. Soil normally needs the winter rains to restore field capacity before it loses water to drainage. Not this year, (this was 2012) our soil, unusually for summer, is still at field capacity and when it rains, it drains! How topical! How tropical? I suddenly sit up really excited now. What if the sponge was compost in a seed tray or a plant pot? I experience a moment of acute revelation as I gently tip the sponge from the horizontal to the vertical and water cascades out. 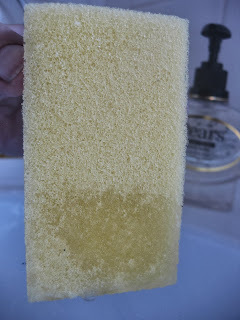 The depth of the sponge has affected its ability to hold water. Eureka, compost in thin layers holds a lot of water at field capacity, more than the same compost in a deep container. 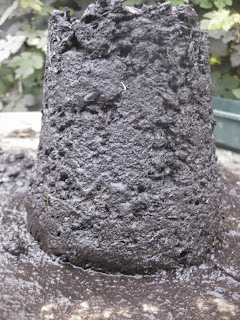 If the compost holds less water it is better aerated. I examine the still vertical sponge closely. It is much wetter at the bottom than the top. Compost in pots is the same. Maybe old fashioned crocking of pots wasn’t so daft after all! Water ceases to drain when the quantity of water settles to the lower field capacity of a deeper profile. But look the base of the profile is wetter than the top! Does water in a pot behave like that? Excited now, I squeeze the sponge and water runs out. Perhaps my squeezing represents the plants as their leaves transpire, sucking water from the soil. Perhaps it also represents the water that is lost by evaporation from wet soil. Squeezing the sponge a little harder, I only get a little dribble. I squeeze really hard, no more water. But the sponge is still wet! Soil is like that, the plants cannot exert enough root pressure. Clay soil hangs on to as much as half the original water it was able to hold when at field capacity. Plant roots cannot squeeze hard enough to extract it. I relax and sink down in the bathwater, still pondering that when I water a plant in a container I will raise the compost to field capacity. If I generously water, as I usually do, the surplus rapidly drains away. What if my plant pot was in a saucer and the water had nowhere to go? The compost will be water-logged. It will be above field capacity and will be poorly aerated. I sag deep into the bathwater with a quiet shudder. By this time I have got goose pimples and resolve next time to take a shower. I used to use this analogy to my students. One year they presented me with a set of red toy ducks at the end-of-course alcoholic celebration! Now what does the water that leaks from the wet sponge represent when my hand trembles ….? Maybe a soil scientist will post a suggestion. I fill a seed tray with compost and thoroughly water it.. and again… and again, to demonstrate that it really is at field capacity. At each watering surplus water drains. I leave the seed tray for about a quarter of an hour. Because it is only at field capacity no more water drains over this time. I have made a slit in this pot and filled it with sand and thoroughly watered it to examine the profile after drainage. It is wetter at the base than the top. Practical significance of field capacity theory. I used to refer to field capacity in a pot or a seed tray (or a sponge for that matter) as ‘container capacity’. A growing medium in a shallow container will have a higher field capacity than the same medium when it is part of a deep profile such as in the ground. In a normal season in the UK, soil in the ground wets up overwinter and is restored to field capacity. Only then will further rainfall run away to drainage. February is not called ‘February fill-dyke’ for nothing. Because a great deal of water per unit volume is held at container capacity, garden soil will often hold too much water if used in containers and will be poorly aerated. Seed and potting composts are formulated with ingredients that are well aerated when at field capacity. Shallow seed trays hold a lot of water after watering. A good thing for a tray of vigorous water hungry bedding plants but not so good for small seedlings if you water too often. Some gardeners cause themselves endless problems by economizing in the amount of compost they use and sowing or pricking out into only half filled trays. The compost lies too wet. The real reason that some plants are found to do better in deep containers (e.g sweet peas are often sown and grown-on in ‘long pots’) is that the growing medium is better aerated after watering. The reason that outdoor plants in shallow display containers frequently die in wet weather is that they are badly aerated when they remain for a prolonged period at a high container capacity. Thin layers of ‘amended’ soil in the ground, especially when overlying a gravel drainage layer(!) may hold excessive amounts of water and be poorly aerated. Such a gravel layer provides an unfortunate discontinuity to capillary water movement down into the soil. A soil is at field capacity when it holds all the water it can against gravity assuming free drainage. Container capacity is a term used by some growers to refer to the field capacity of a growing medium in a container - or a block of compost - or even a sponge! I failed with this experiment to demonstrate clearly that water levels at the base of a soil profile is greater than at the surface. By now some of you will have decided I am somewhat mad. I present you with evidence - I make mud pies. Guilty m’lud as charged. Very interesting and informative. So does walking on soil squeeze our more water by compacting it? Three questions come to my butterfly mind though. Do you bath with a scouring pad? You have a drink of coffee while bathing. Did you dress before heading out into the garden? Rewritten as the order of my comment went wrong! Trust your fertile mind to think of a question not in the text book! Even featherlite you might displace some of the water in my sponge if you stood on it and I expect some water would be lost if you trod on a freshly watered seed tray. In the ground I would guess even a heavy tractor would displace little water. Perhaps it equates to my trembling hand. I bathe to relax and read. Brenda says it does not bear much relation to washing! I don't normally drink in the bath and as I normally change into my dressing gown I do not go into the garden- although It has been known, in my dressing gown. Sorry, I'm confused! Does crocking of pots provide a discontinuity and therefore not such good drainage as you might expect? Great blog! Thanks. No my comment was a throw away remark as I don't really understand the implications myself. Personally I never use crocks in well drained plastic pots that have many drainage holes and if a large a container just has one little drainage hole I might place a few broken clay shards around it so water has a route to flow to it. As to container capacity theory I just have the thought that traditional crocks of a broken clay pot must have some kind of capillary attraction which might pull water from the wet zone? On the other hand if a gardener filled the bottom of a pot with gravel that would merely reduce the effective depth of the pot and make it wetter? So you can see Peter I have confused myself on this one.I used to me amused in the old days when some gardeners would buy a commercial houseplant in a plastic pot and knock it out to put crocks in it! Well Roger, What can I say, indeed what can anyone say about your methodology! Yet another thought provoking post. I think the sponge is an interesting analogy for compost in a container as a good peat based compost would have similar properties including an ability to recover from some compression although that is something which should not be experienced in a container. 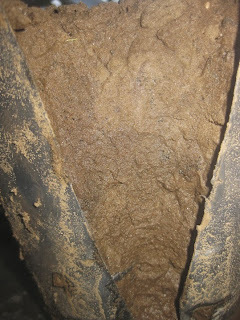 In the case of field soils, we have the problem of compression causing damage to the soil structure destroying any sponge-like properties it may have reducing its potential field capacity even allowing for good drainage. Just thought I would muddy things further. As a no dig gardener I do not ‘do’ compaction and as to my methods I don’t suspect many people do them in their bath. Frivolity aside, I agree that in containers there should be no compaction and I hardly ever firm down when I pot or prepare compost to sow seed or prick out. I don’t agree that perhaps container capacity theory is more relevant to peat based and similar materials. As I wrote in my now ancient post ‘Breaking the rules’ I actually use my sandy soil for virtually all my potting and I apply all the principles explained in my current piece. As to compaction in the ground . Very interesting how it might effect field capacity and it sounds as if you know more about it than I do. I would expect (?) compaction to increase field capacity because the squashed spaces hold more water by capillarity than larger pores which will contain more air. I did not emphasis in my post that field capacity is usually a desirable soil condition where in a good soil or compost there is a happy balance between air and water. Where compaction becomes complicated is where it interferes with drainage and the soil rises above field capacity and becomes waterlogged - normally a very undesirable condition. Please Rick don’t think I am preaching to you about what you already know. I like to use perceptive comments such as yours as an excuse to add a bit of general interest. Very interested in your observations Roger, but feel I ought to reply. I have read your post about the use of the exceptional sandy soil which you are lucky enough to grow on, but would point out that, as a member of the pro-peat lobby that nothing holds as much water or has the ability to contract and expand according to its moisture content than peat, similarly with a sponge, which is all I meant by using it as an analogy, you often hear a peat bog being described as a giant sponge. In the case of compression in field conditions or for that matter your border or grassed area, the problem is that if the soil structure is damaged it doesn't matter if the space between the soil particles contained water, air or, I suspect a balance of each in good soils, if it no longer exists due to compression, this will lead to water-logging, sour soil etc. This is where the addition of organic matter, not necessarily peat is invaluable to keep the "pores" open to produce a friable loam (love that expression). I appreciate as the "No Dig Gardener" it does not apply to you, but in open field conditions, particularly with crop rotation, this is crucial. I have only recently started to follow your blog but find it excellent, particularly with your "off the wall" themes, and although we may not agree on everything I have become a dedicated follower. I have no problems with your comments about the benefits of organic matter Rick, although you will have seen in my posts I am rather keen on using the organic matter produced in situ by natural processes as directly as possible rather than importing too much organic matter from other places eg the garden centre! Having said that I am in the peat lobby too and agree that the happy balance of water retention and aeration of a granulated peat at field capacity in a compost is superb. 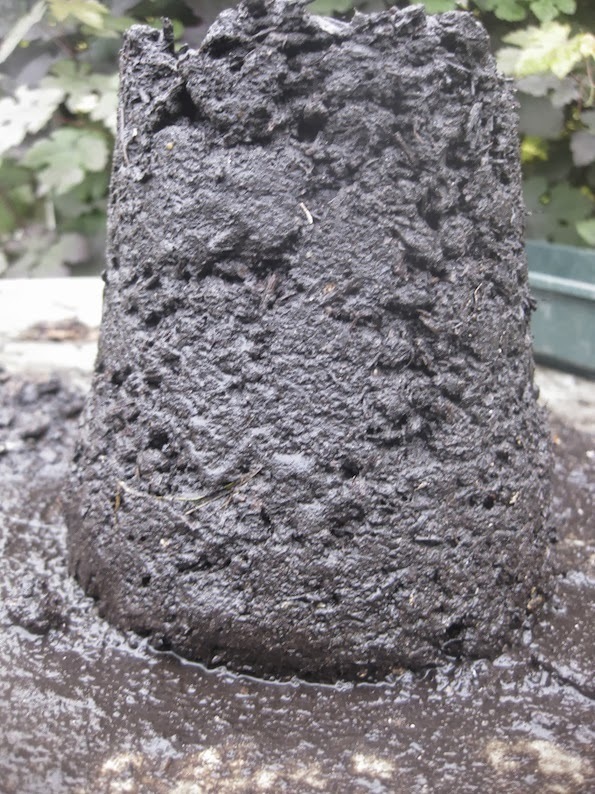 Now I do use my sandy soil for compost although it's aeration is nowhere near that of peat, sand cannot be compressed beyond a certain point and for most purposes I get excellent results. What I don't miss with peat composts is the problem of wetting them up properly when they have been allowed to dry out by unskilled watering. PS, keep picking me up where you don't agree.